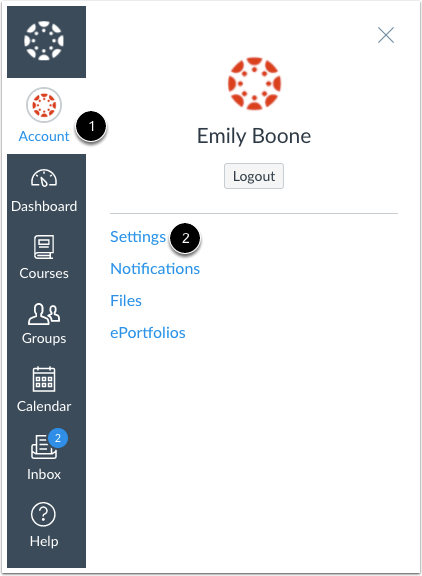 How do I connect to Skype as a web service in Canvas as a student? 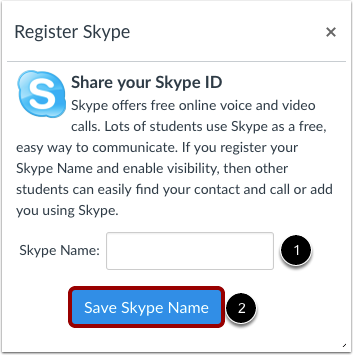 Here you will learn how to connect to the Skype web service in Canvas. This integration allows you to send friend requests to other users in your course who have also connected to Skype. It will not allow you to use Skype directly in Canvas. 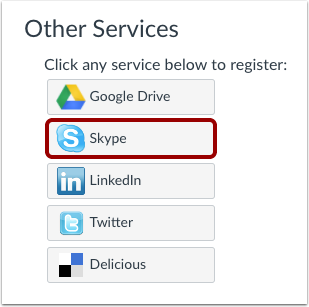 In the Other Services section, click the Skype button. Enter your Skype name in the Skype name field . Click the Save Skype Name button . Skype will now appear under the Registered Services heading in your Canvas settings. Previous Topic:How do I connect to Twitter as a web service in Canvas as a student? Next Topic:How do I connect to LinkedIn as a web service in Canvas as a student? Table of Contents > Web Services > How do I connect to Skype as a web service in Canvas as a student?